We are very close to complete RC Plane 3 first “true” update (finally new features, not just bug fixes !!! ), bringing MULTIPLAYER ! It’s now finally time to share some details. Version 1.1 will come with 2 multiplayer game modes, Free Flight and Air Combat. While Free Flight will debut as a simple multiplayer version of regular free flight, Air Combat it’s completely new to the RC Plane series and it’s basically a team deathmatch in which two teams of 2/3 players (still evaluating limits for first multiplayer version) will spawn at different airstrips around one of the RC Parks with a limited number of “tickets” , players armed of a default paintball cannon and various “pickup-able” firework based homing missiles, will have to reduce the opposing team tickets by shooting their players down or making them crash. Over your team airstrip you will find battery, ammo and repair pickups to keep your plane fighting for extended periods without the need for a precise landing (which you can still do for immediate full repair). TO KNOW : each airstrip is guarded by very efficient Anti Rc Aircraft cannons, so you will have a semi-safe portion of the sky to fly back to and lick your wounds. Air Combat will be free and in the first release there will be no kind of vehicle filtering so all vehicles can partecipate, we are working at ways to allow vehicle filtering in the near future. Version 1.1 will also bring 4 new planes chosen among the most popular WW2 fighter planes, 1 of the 4 will be free for all while the other 3 will be available as a single bundle to purchase. For “free-only” users : ads will display only after a certain amount of time one from the other, so that you won’t see an Advertisement each time you go to the main menu or towards the scenario. EDF Engine audio bug fix ! 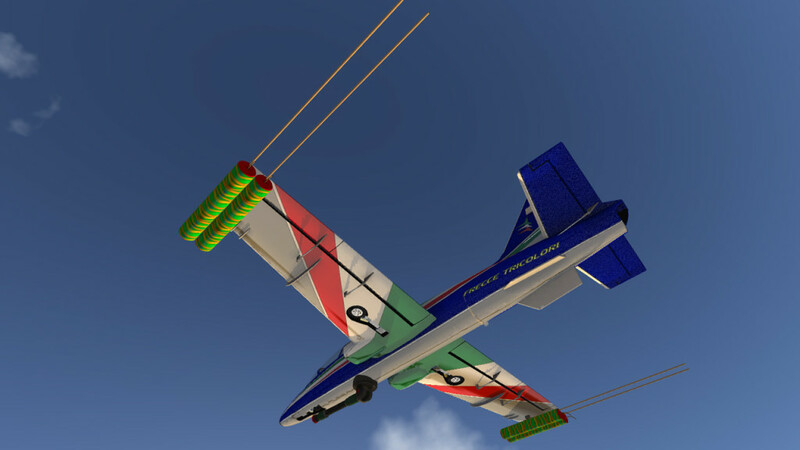 In the screenshot the trainer jet armed with 4 firework missiles and a paintball cannon ready for battle ! Hi Phillip, the plane resembles very much the trainer jets produced by “Aermacchi” and the paint scheme is of the Italian “Frecce Tricolori” our flight demonstration squadron. It sold to Air Forces all over the world to train fighter pilots. About Pc or OsX version, yep it will come. Love RC Plane 2 and hope RC Plane 3 is just as good! Keep improving the “realism” of flight characteristics and engine sounds for improved performance! The Corsair is my second favorite plane of all time so it’s good to see that it’s a beast in the game 😀 It’s pretty impossible to find a Match right now because of the lack of players, but I’m sure that when the time comes, it’ll be epic. I’m still keeping my fingers crossed for the inclusion of some sort of VTOL. Also, I couldn’t figure out how to file a formal bug report, so I’ll just post it here. When you fly into the long bridge-like structure with multiple arches at an angle (30-55 degree) you fly right through it occasionally. It’d be cool if a record session option was available to show you the glitches as they happen. Ikr! There are no players!